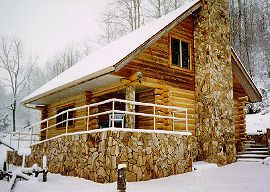 Whispering Winds is a secluded hand-crafted log cabin nestled in 40 acres. The cabin offers you a stone fireplace, claw-footed bathtub and wide porches where you can experience the serenity of the Great Smoky Mountains. 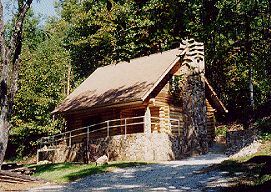 It is just a short walk to the river where you can kayak, raft, fish or if you prefer to venture away from the cabin, you are only minutes away from the Deep Creek entrance into the Great Smoky Mountains National Park where picnicking, tubing, hiking, horseback riding, mountain biking and waterfalls await you. Nearby Attractions: 5 minutes from the Great Smoky Mountain Railroad 10 minutes from Cherokee 20 minutes from the Nantahala River 45-60 minutes from Gatlinburg. This and other cabins can be found here in The Register.